City yard and Public Alley 444, looking e. from Mass Ave.
Public Alley 444 looking easterly showing rears of 354-348 Newbury St.
Public Alley 444 in rear of Newbury St. looking w.
Boston Cab Co's building corner of Mass Ave. and Newbury St.
Building at n.e. corner of Mass Ave. and Newbury St.
Junction of Comm. Ave. and Beacon St., looking n.e. Site of incline, junc. of Comm. Ave. and Beacon St., looking n.e. Wall between Public Library and Boston University, Boylston St.
Sidewalk - Boylston St. side of Berklwy building at Berkley St.
Hotel Somerset, cracked arch and sill, 8th window from Newbury St.
Work on sec.1, Commonweslth Ave. looking easterly from roof of 660 Beacon St.
Part of 376 Newbury St.
Part of 378 Newbury St.
Part of 380 Newbury St.
Part of 380 and 382 Newbury St.
Part of 386 Newbury St.
Part of 410 Newbury St.
West wall of 410 Newbury St.
Part of 412 Newbury St.
Part of 418 Newbury St.
Part of 418-420 Newbury St.
Part of 420 Newbury St.
Part of 422 Newbury St.
Part of 428 Newbury St.
Part of west wall, Volkmann School, Newbury St.
East end of brick fence, Volkmann School, Newbury St. Crack at junction of brick fence and 405 Newbury St.
Part of 405 Newbury St.
Part of 403 Newbury St.
Part of 401 Newbury St.
Part of 399 Newbury St.
Driving piles, sec.1, Commonwealth Ave.
Doorway Boston Cab Co. Building Massachusetts Ave.
Area, Boston Cab. Co. Building, Newbury St.
Work on sec.1 at junction of Comm. Ave. and Charlesgate West, looking s.e. Driving steel sheet piling in front of the Eastgate, Newbury St.
Part of Tennis and Racquet Club building corner of Hereford and Boylston Sts. Part of Tennis and Racquet Club building 297 Boylston St. Crack in area wall 925 Boylston St.
Bay window, west of 845 Boylston St.
Part of 905 Boylston St.
From corner of Gloucester St. to 867 Boylston St.
Bay window east of 845 Boylston St.
Part of 841 Boylston St.
Part of 839 Boylston St.
Part of 829 Boylston St.
Part of 803 Boylston St.
Part of 737-735 Boylston St.
Cracks in brickwork #727 Boylston St.
Part of Exeter St. face of stone building Boylston St.
Part of Kensington Building Boylston St.
Bay window west of 675 Boylston St.
Part of 665 Boylston St.
Part of 657 Boylston St.
Part of 645 Boylston St.
Part of Old South Church, Boylston St.
Hotel Lenox crack at n.e. corner Exeter and Boylston Sts. In doorway of Jacob Sleeper Hall Boylston St.
Sec.1, Commonwealth Ave. looking easterly from 660 Beacon St.
Sec.1, sta.3, walls showing rods, forms, etc. Boston Cab Co. building Massachusetts Ave. and Newbury St.
Sec.3, Boylston St. looking southeasterly from Gloucester St.
Sec.3, Boylston St. dumping platform, near Fairfield St.
Sec.3, Boylston St. in Fairfield St.
Sec.1, sta.2,looking easterly showing bracing, etc. Sec.1, sta.3, looking easterly showing north sidewall, forms, etc. Cracks in brickwork of 859 Boylston St.
Part of Fairfield St. face of 801 Boylston St.
Part of 751 Boylston St.
Part of Kensington Building 685 Boylston St.
Cracked lintel, west side of building 675 Boylston St.
Work on sec.1, Charlesgate West looking toward Commonwealth Ave.
Steel sheet piling and Bethlehem I beams sec. 1, sta. 1? Boston Cab. Co. building from Boylston St.
Boston Cab. Co. south wall at 2nd pilaster from Mass. Ave.
Sec.1, Commonwealth Ave. from 660 Beacon St.
Sec.1 in the Fens, looking southerly from Comm. Ave.
Sec.3, Boylston St. looking west from 729 Boylston St.
Excavating sec.3 looking east from 755 Boylston St.
Sec.3, Boylston St. looking east from near Hereford St.
East side of Dartmouth St. near corner of Boylston St.
Sec.1, sta.11+20 looking up showing bracing, etc. Part of Old South Church, Dartmouth St.
Arch reinforcement before connecting opp. Gloucester St.
Arch reinforcement sec.3 opp Gloucester St.
Sec.2, looking n.e. from Boylston St.
Sec.2, retaining wall north side of Boylston St.
Cab Co. building corner Mass. Ave. and Newbury St.
Sec.3, Boylston St. looking east from Exeter St.
Sec.2 in City Yard, looking northeasterly from Boylston St.
Incline covering corner of Comm. Ave. Kenmore and Beacon Sts. Bricks beside Cab. Co. building, looking easterly from Mass. Ave.
Windows just west of tower, Old South Church, Boylston St.
Windows, Old South Church, Boylston St.
Part of Trinity Church at corner of Clarendon and Boylston Sts. Part of Hotel Brunswick, Boylston St.
New building 569 Boylston St.
Alley 444 rears of nos.348, 346, 344, 342 Newbury St.
Part of rear of 340 Newbury St.
Part of rears of 344-342 Newbury St.
Rears of 346-348-350 Newbury St. Interior of basement 354 Newbury St. Interior of stable 352 Newbury St. Interior of stable 350 Newbury St.
Part of eastern wall of Boston Cab Co. Interior of stable 356 Newbury St.
Cab. Co. building from Boylston St.
Sidewalk by Old South Church, north side, Boylston St.
Sidewalk by Library south side sec.4 Boylston St.
Sidewalk, corner Clarendon Copley Sq. Sidewalk Dartmouth St. west looking torard Boylston St.
Sidewalk Dartmouth St. from Boylston St.
Sidewalk Dartmouth St. side looking north from Huntington Ave.
Cracks in column, Berkley Building, 422-424 Boylston St.
Steps at 480 Boylston St.
Part of 490 Boylston St.
Part of 496 Boylston St.
Part of 498 Boylston St.
Part of 504 Boylston St.
Light wells, Natural History Museum, Boylston St.
Rogers Building, MIT Boylston St.
Walker Building, MIT 525 Boylston St.
Hotel Bristol, Boylston and Clarendon Sts. Hotel Bristol, 541 Boylston St.
Part of 543 Boylston St.
Part of 549 Boylston St.
East area wall, 555 Boylston St.
Front area wall, 555 Boylston St.
West area wall 555 Boylston St.
Bay window 557 Boylston St.
Part of 585 Boylston St.
Part of 601 Boylston St.
Cab Co. building Newbury St.
Cracks in east area wall, 369 Boylston St.
Public Garden, from Charles St. near corner of Boylston St.
Public Garden, looking southeasterly toward Park Sq. Street occupation Newbury St. looking east from Mass. Ave.
Construction at Cab Co. site looking easterly from Mass Ave.
Building at s.e. corner of Arlington and Boylston Sts. Sidewalk, n. side Boylston St.
Hotel Thorndike Boylston and Church Sts. Walks on the Common at corner of Charles and Boylston Sts. Sidewalk at s.e. corner of Arlington and Boylston Sts. Sidewalk at s.w corner of Boylston and Church Sts. 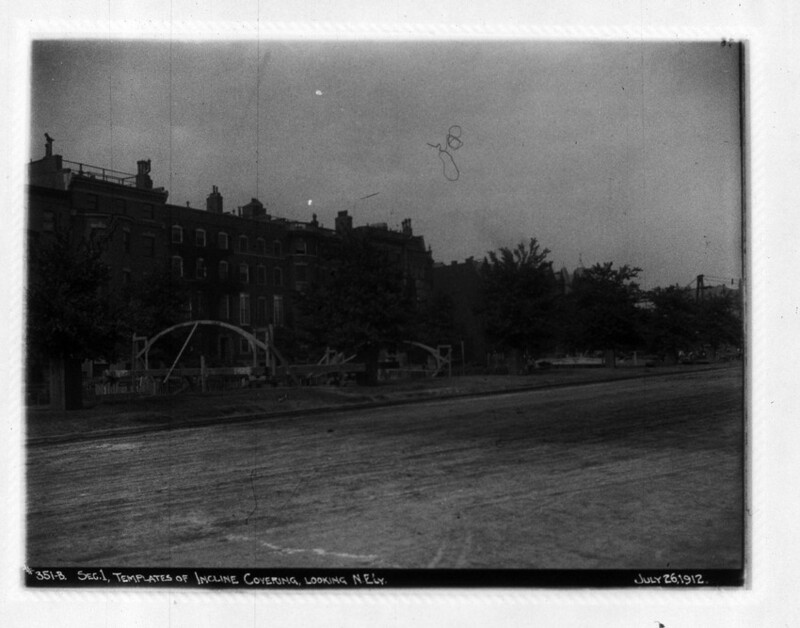 Entrance to Public garden opposite Church St.
Westelan and new building, Boylston St.
Sec.5 occupation of Boylston St. looking west from Charles St.
West sidewalk of Berkley St. corner of Boylston St. Fence at site of stairway from Boylston St. to Mass. Ave. Trees on west side of Tremont St. mall looking s.e. New paving Boylston St. east of Clarendon St. Pipes crossing opposite West St.
Sec.5 drilling out concrete, Public Garden near Charles St.
Moving subway building, Boston Common interior showing, bracing, etc. Massachusetts Station enctance and exit of Mass. Ave.
Pavement at fence of Park and Tremont Sts. The Kenmore St. incline Commonwealth Ave.
West side 356 Newbury St.
Boylston St. sidewalk by Public Garden looking n.w. Boylston St. sidewalk by Public Garden looking from Charles St.
Public Garden from Boylston St.
Public Garden looking north from Boylston St.
Sidewalk at Shuman Building corner Boylston and Washington Sts. Showing condition of paving in stockyard in Providence St.
Sidewalk at 352-362 Boylston St.
Sidewalk at 350 Boylston St.
Sidewalk at 276-286 Boylston St.
Sidewalk at 288-298 Boylston St.
Sidewalk at 280-288 Boylston St.
Doorway and step 308 Boylston St. Entrance to 288-290 Boylston St.
Bridging south side Boylston St. east of Arlington St.
Bridging in Arlington St. south of Boylston St.
Sidewalk at 352 Boylston St.
Sidewalk at 352-356 Boylston St. Subway entrance, new Old South Church, Copley Sq. Children in a lot near Kenmore Sq. Arlington St. Church, Boylston St.
Wesleyan and new building Boylston St.